Although you might be pardoned for the omission of ∆AIMON’s first EP, there’s little chance that you managed to go through the past 12 months with no knowledge of the follow-up. Released initially some months back, Flatliner returns remastered and bundled with a collection of remixes, courtesy of Artoffact Records, and whether you’ve heard it before or not, let it be reiterated that it’s an essential musical experience. Brant Showers and Nancy Lutz, the husband and wife duo that are heart and soul of ∆AIMON will take you on a journey that reveals their artistic sincerity and prowess and elevates their act beyond the majority of dark, moody electronica out there. The opening of Flatliner is nothing short of compelling and “Current,” in an intriguing and frightening way, sets ∆AIMON’s sophomore effort in a ponderous motion. Ambient overtones layered on top of a skipping beat are swallowed by an intricate explosion of sounds, melodies, and words which in turn paves the way for a mesmerizing, darkwave lead that anticipates another, inevitable crescendo. So sudden, immediate, and powerful are the shifts in the order of “Current” that its rich, emotional value imprints itself permanently upon the listener’s perception of ∆AIMON. With only the sweet, hypnotic voice of Nancy Lutz as the guide through the dark flow of “Black Cross,” this second track will sweep all listeners off their feet and wash them in an elaborate, gothic ballad that bands like The Birthday Massacre attempted to perfect. Unlike those projects, however, the deliberation and determination that appears to be integral to the creativity of ∆AIMON is employed into the cogs of this composition with a foreboding sense of authenticity. The duo’s continuing attraction with the shadowy realms of musical expression bears no hints of forced stylization and the sincerity with which the listener is drawn to participate in this vision is both surprising and welcome. The dynamic between the duo and their atmospheric means of expression seems genuine and the music that they produce as a result potently resonates with the audience. In the coda to “Emptiness,” the music and vocals are shiver-inducing and their ability to penetrate so deeply sources in nothing else but the band’s ability to translate their occult inspirations into a lossless musical form. Even if both members of ∆AIMON, like many other soldiers of grave wave, hide behind the anonymity of the Unicode symbols, their album honestly maps the extent of their influences and methods. At their genesis that brought to life EP Amen in the early 2011, ∆AIMON was drawn into the growing cohort of witch house bands whose original blend of industrial and hip-hop marked them, to a certain extent, idiosyncratic. Some of those early tropes in the work of the couple are reinterpreted on Flatliner and “Choke” with its considerate pace and blunt, tripping beat is an obvious example of ∆AIMON’s focused evolution. Acoustic elements and thoughtfully incorporated ambient sounds enrich the slow burning composition. The following “Mirrors Fade” that opens with a dirty, distorted vibe and edgy electronic arrangement incorporates heavily modulated vocals coupled with enigmatic bells and chimes. 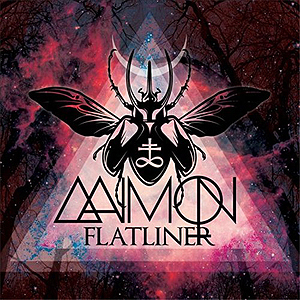 The undeniable musicality and high fidelity with which all the tracks confirm and perpetuate ∆AIMON’s moody sensibility is the ever present delight of Flatliner. The extended version offers remixes and is headlined by some of the industrial scene’s hottest acts. The choice alone rivals the thoughtfulness with which the album was put together and the effort that was put into rearranging ∆AIMON’s compositions results in a companion piece that boldly reimagines and reworks Flatliner’s compelling content without ever compromising its romantic core. Unison provides a charged electro-pop backdrop for “Current”’s already memorable melody line, while ▲NDRΛS’ take is at first more restrained but soaked in lush electronic instrumentation. The guys from Dead When I Found Her exploit the faint glimmers of pop capacity from “Black Cross” and successfully reinterpret it into a synth heavy, old school derivative. The usual inferiority that is reserved for second disc mix efforts has no place on the extended version of Flatliner – an album on which nothing was left to accident and all is arranged into an accomplished package. Some projects require an abundance of time to develop and refine their creative flux, but in a relatively brief period, ∆AIMON managed to transcend those initial tropes and elevate the style beyond any necessary genre classification. They are a band with a cracking release that continues to play out in the listener’s head, continuously shifting its form like a living, spiritual entity. Flatliner is an album that sets the expectations sky high for the band’s future efforts but its assured pace and faultless tones leave little doubt as to ∆AIMON’s capacity to deliver. For once, the hype surrounding a release did nothing to harm its true value resulting in a record that you can’t afford to miss.